Fess up folks... you want it... you know you do! Vey nice snare drum i wonder what the drum set looked like? PDP9000 wrote: Very nice snare drum i wonder what the drum set looked like? Back then the "kit" would have this snare drum and a 14x28" (0r 14x30) Black Lacquer bass drum with gold tube lugs, a set of temple blocks, a cowbell and a snow shoe sock cymbal. 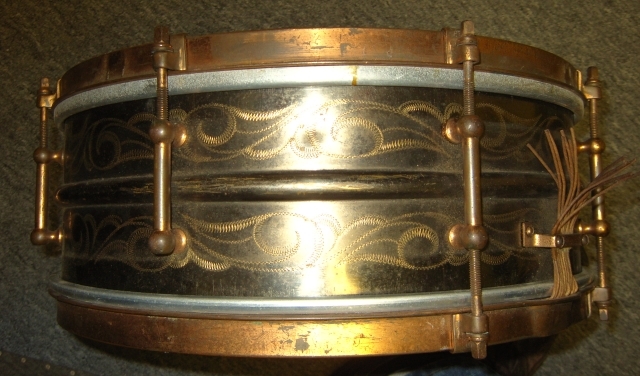 BTW, this drum is for sale as is, or fully restored, contact me in PM if you're interested. 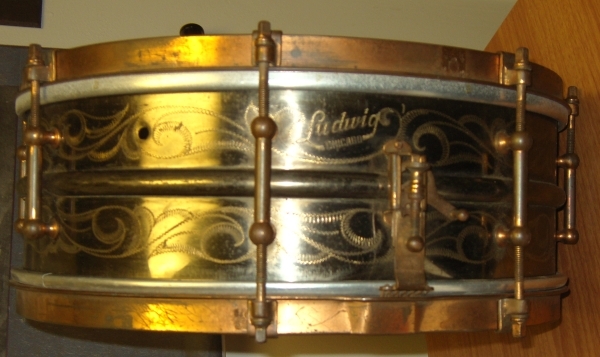 I got to see this snare in person. It was an honor to just be in the presence of something so significant to history of drums. Thanks Mike! one word and one word only....WOW!!! WHAT IS THE GOING PRICE ON THIS BABY NOW A DAYS. Impressive Zen, Where did you find this? How long have you had it? Freind of mines got one of those with all the lugs and in excellent condition. He is 55 and it was given to his father durring his teens. New I think. WOW, that's incredible. I think I have a matching shotgun with similar scrolling!